Is there any way, without joining any type of regestry or fees to find out how early my 07 GT/CS was produced in relation to the total # ? Reason I ask is the build date on the door sticker is 06/06, and at the very bottom of my original window sticker the last digits in a series of numbers and letters is 06 20 06. Just trying to find out how early mine was made, mayby one of the first run? Last edited by GrumpysGT; 1/25/13 at 03:37 PM. Well the dealer maybe able to tell you. I paid 45 bucks and got a certificate of authenticity for mine. Go to ford performance and you will see them. here is a pic of mine so you know what it looks like. Thanks, but it's not important enough to me to shell out 45.00. Just thought someone might know when Ford started the build on the GT/CS's. I know the first owner ordered it when they were first announced and probably paid MSRP. He had it for only 5-6 months and had to trade it back to the original dealer to get a pick-up. 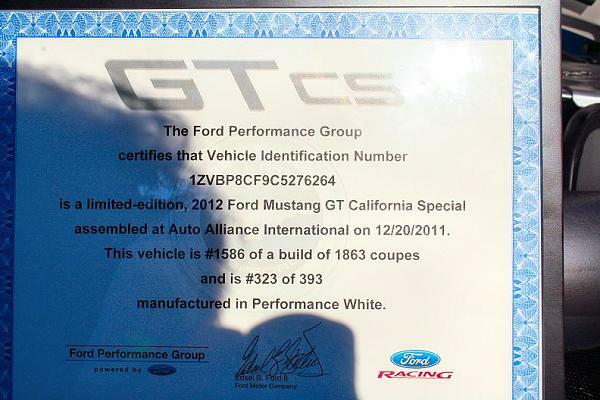 I got it in Dec. 07 with only 3000 miles. Do know it's only one of 231 with that color combo. Last edited by GrumpysGT; 1/26/13 at 04:55 AM. I agree. It seems kind of silly to pay someone for a piece of paper that tells you information that OUGHT to be easily discoverable by anyone. I would like to know the details on mine too, but I have never been one to value certificates much. I already know that mine was a fairly rare combo before the custom interior was done just because of the lack of pictures on a Google search. Not to belittle the guys who do the certs or anything, but that $45 could fill up my tank or buy some accessories! Thanks for posting. People love those placards and certificates at car shows. That is exactly why I got mine.. For Car shows. It is tough to win with a newer car so everything helps.